These are SO very much Not-Your-Mother’s-Croquettes! 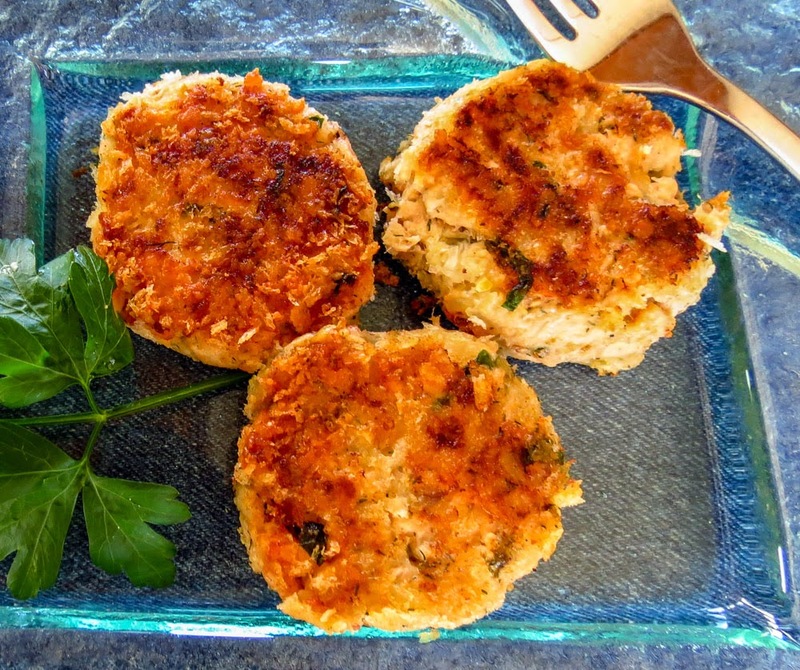 Well, at least not my mother’s version of croquettes, those dreaded salmon patties of memory. My father absolutely loved those canned salmon patties with skin and bones included, while I was still in my non-seafood loving years, so it might not be fair to slight my mom’s cooking. I do remember moving them around on my plate, pushing them from side to side, wishing they would just disappear, long after the homemade crinkly French fries had been inhaled. But that was then, and these little cuties are so delicious they would tempt even the fish-avoiding me of long ago. Working with the previous night's salmon, grilled with our Not-So-Secret Sauce, I added an equal amount of Cheesy Mashed Potatoes loaded with grated cheddar & Parmesan cheeses, cream cheese and sour cream. Next came some Italian parsley, green onions and a few seasonings. Don’t have any great tasting leftover salmon or mashed potatoes? Get creative and add some onion, bacon, lemon zest, dill weed, cheese and seasonings to plain salmon and taters – you know you want to! Salmon Croquette recipes abound online and in hardcopy, each version with its own slight variation in ingredients and technique. 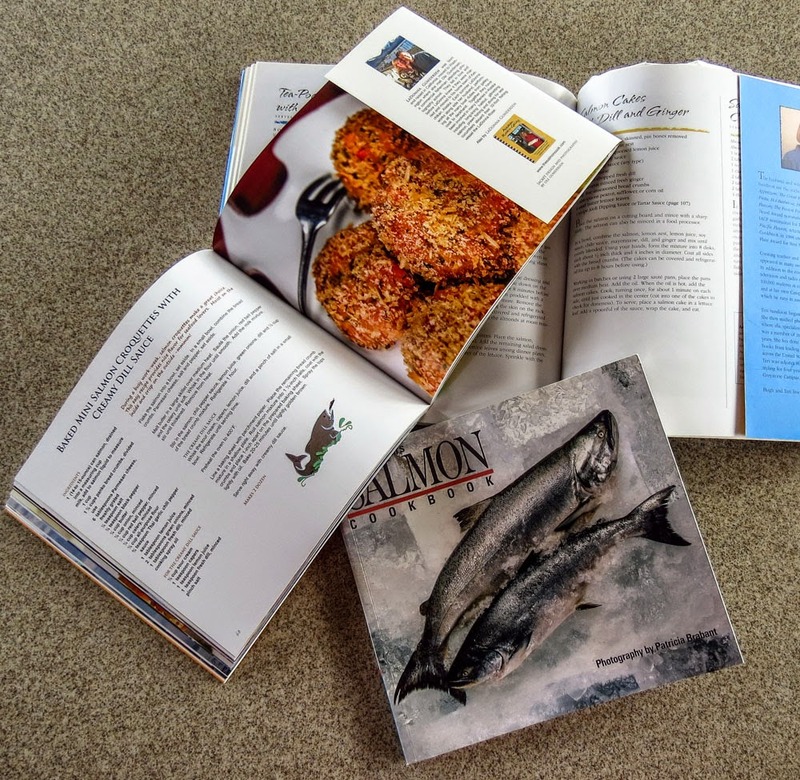 I skimmed a few seafood cookbooks from my onboard collection, then decided to wing it and improvise. 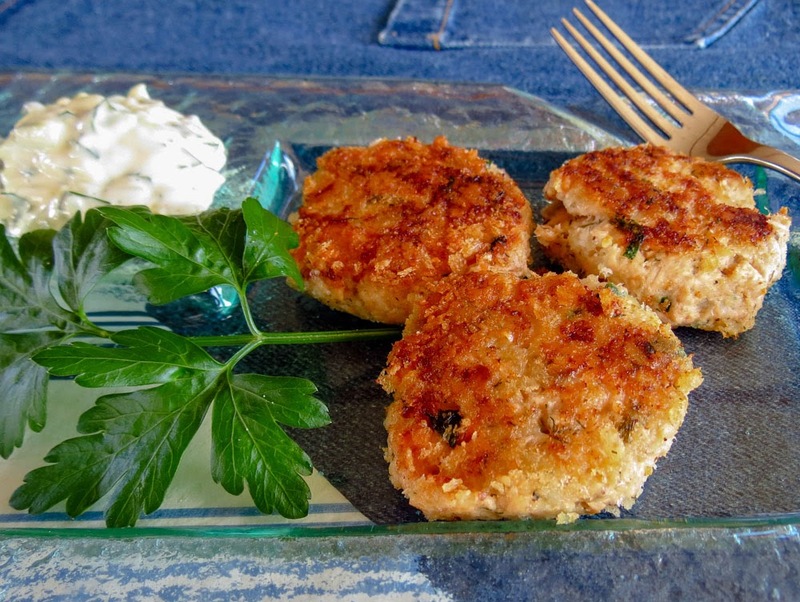 Many croquette recipes use bread crumbs as a binder, a lot of bread crumbs, stretching a small amount of salmon into a meatloaf-sounding dish. Replacing bread crumbs with a mashed potato mixture creates a lighter, fluffier texture that doesn’t mask the salmon component, and the light panko coating produces just enough crispy crunch without making the croquettes too bready. Add some Cucumber Tartar Sauce to take this dish over the top. Change things up a little and form tiny patties for appetizer plates. 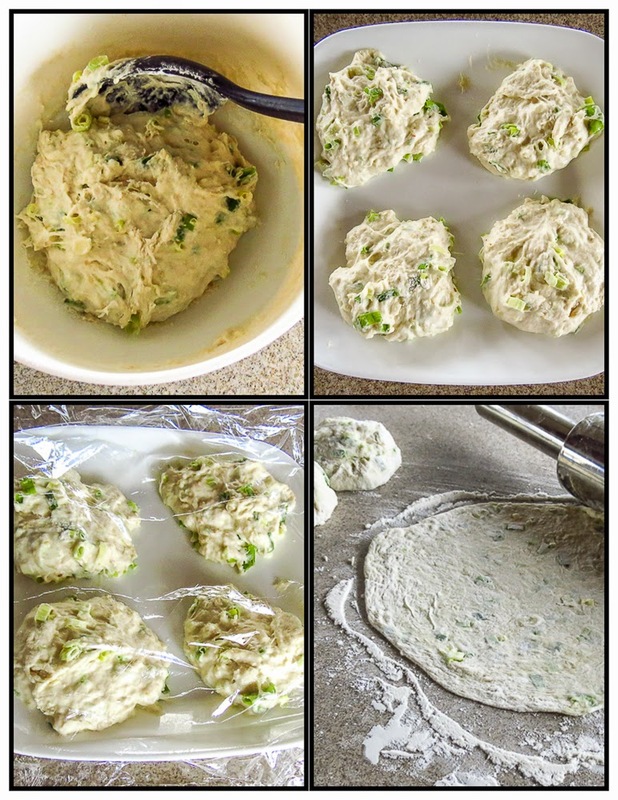 Or pop them into small biscuits or rolls to serve as Salmon Sliders. Perhaps make larger croquettes for a more substantial entrée. Mmmmmm, I get hungry all over again just thinking about the possibilities. Capt. Ron, it’s time to go fishing again. Add the cooked, skinned and boned salmon to a mixing bowl, and include as much of the cooking sauce (bacon, green onion, lemon, dill, etc) as possible. Add the mashed potatoes, onion powder, garlic powder, dill, salt and pepper; use a fork to mix thoroughly. Divide the mixture into six equal portions and form into golf-ball sized spheres. For each ball, pack together firmly and then flatten into a patty about ½-inch thick. Use a flat plate or pie tin and combine the panko and Parmesan cheese. Coat each salmon patty on all sides and leave on the plate with any remaining panko/cheese breading. Cover with plastic film and chill for at least one hour. Heat the oil and butter over medium-high heat until bubbly but not smoking. Cook the patties, turning once, until browned on the surface and warm in the center, about 1 ½ to 2 minutes per side. Combine all ingredients in small bowl. Taste and adjust to suit your taste. Refrigerate until serving time. On the boat, in port, at the dock, with another day of rain, and waiting for a delivery via airfreight. The activity began with an extra quarter-cup of sourdough starter, but without a plan to use it. I just knew that I wanted to play be productive in the galley instead of heading outside for a walk. I know, I know, I can be such a weather wimp – well, sort of... sometimes. Ordinary rain is fine, even pleasant, but heavy, pelting downpours are totally for ducks! Today felt like a comfort food "soup-and-something” kind of day, so why not make a sourdough “something” to enjoy with our Asian ginger chicken soup. Mmmm, just thinking about it perked up my tastebuds. I was inspired by a recipe for Asian-Style Flatbread found in my latest favorite cookbook, the Soup & BreadCookbook by Beatrice Ojakangas. 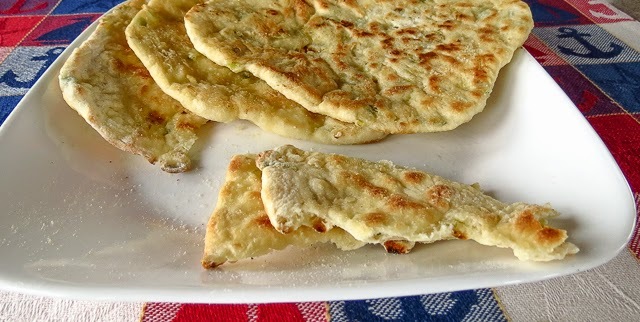 Her flatbread is more of a quickbread pancake or maybe a fluffy tortilla, with added yeast to contribute some light airiness. Surely sourdough would be a positive addition, at least it was worth a try. Let the fun begin. 1. The ingredients, all ordinary galley items, came together quickly in the mixing bowl, but the dough was too sticky to work. This might have been due to the wet weather or even the too-loose consistency of my sourdough starter. It required several small additions of flour, added one heaping tablespoon at a time, to achieve the recommended “slightly stiff” batter. 2. The “lightly floured” surface and rolling pin still wanted to grab the dough, so I sprinkled a bit more flour onto each dough ball, kneaded it in briefly, and proceeded with more success. Evidently the dough wasn’t “stiff” enough initially, once again I’ll blame the weather or the starter. 3. Size/thickness matters. I rolled out the first round too thick. It puffed nicely in the pan, but the outside surface overbrowned while the interior was still wet. Rolling the second disk thinner helped, but it still seemed undercooked. Covering the pan with a lid for part of the cooking time handled the problem nicely, creating a crunchy, browned exterior with a soft but cooked interior. 4. Oiling the pan at the start produced an attractive golden crust with distinct sesame flavor on side one, but added little to side two. 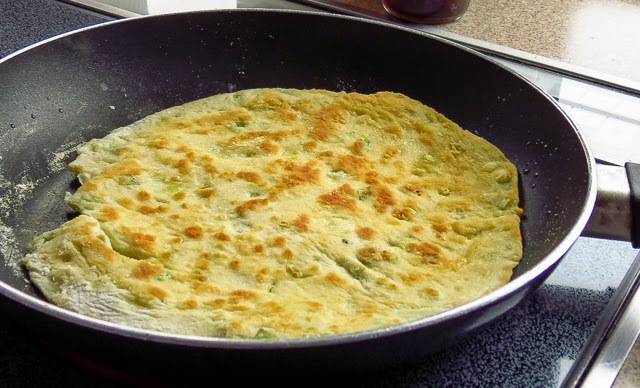 Try adding more oil to the pan for side two, or spray the uncooked side of a flatbread before flipping to improve appearance and taste. 5. The dough needed more salt. The original recipe suggested serving the flatbread with a soy sauce and mayonnaise dipping sauce, so perhaps Ojakangas held back on the salt to balance the taste. We dipped our flatbread in Asian Ginger Chicken Soup, in Ponzu Sauce, in Thai Sweet Chili Sauce, in Thai Peanut Sauce. All were fine, but we preferred it plain… or topped with a slather of butter and a quick grind of sea salt. I tore a piece off of the first disk and thought, “Meh, no big deal.” I nibbled on the second flatbread and found it better cooked and maybe a bit more fully flavored. Fast forward to the fourth and final pancake, the double-oiled fully-cooked version with added salt – YUM! We almost fought over the last torn piece with dueling forks. These sesame-flavored, onion-speckled, airy, pancake-like breads were judged to be “keepers”, delicious and unexpectedly popular with the Capt. Oh yes, I’ll make these again, with or without the added sourdough starter. That extra bit of sourdough remained hidden in the background, contributing little to the flatbread's flavor or rise. No big deal, it was an interesting experiment. Sourdough or not, what’s not to like about a flatbread recipe that takes under one hour to go from mixing bowl to table? Add the warm water to a medium-size mixing bowl and sprinkle the yeast over the water. Add ½ cup flour and the salt; whisk by hand or use a mixer and beat until smooth. Stir in the sourdough (if using), oil, ginger, green onions and enough of the remaining flour (or even a bit more) to make a smooth, slightly stiff batter. Separate the dough into 4 to 6 portions and place on an oiled platter. Cover with oiled plastic wrap and let rest for 30 minutes. Roll each mound of dough into a ball, working quickly with floured hands to avoid sticking. Use a floured rolling pin and a lightly floured surface roll each ball into a thin roundish disk, about 8-inches in diameter. Transfer to a plate or baking rack and cover with foil to keep warm. Repeat with the remaining dough rounds. Serve warm as the flatbread becomes more cracker-like as it cools. Cool, windy, wet weather can dampen our enthusiasm for outdoor grilling. The Capt. 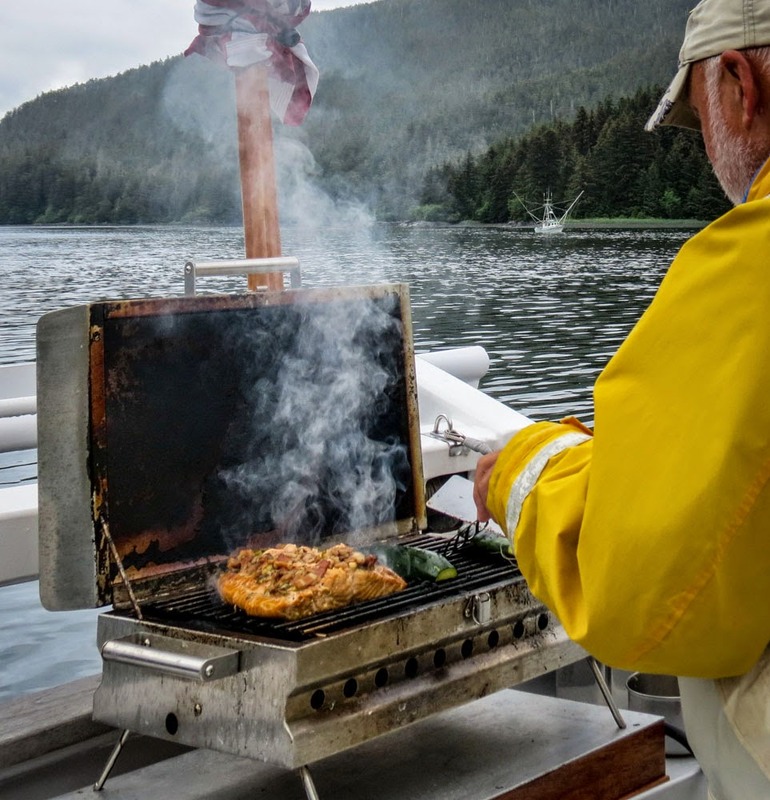 is a hardy grill dude with a good set of rain gear, but swirling, gusty winds often rotate the boat and blow out the gas grill’s flame. Not fun. Well, whoever said you have to grill outside in the summer? This Southeast Asian chicken recipe wins rave reviews whether you use a charcoal or propane grill, stovetop grill pans or even an oven broiler. Tasty results shouldn’t be a surprise since the recipe is attributed to notable chef Christine Keff of Seattle’s Flying Fish restaurant. The coconut milk/lime/ginger marinade flavors the chicken meat and the tangy, sticky glaze adds an amazing finishing touch. Layers of flavor plus a gorgeous appearance make this dish a winner in my galley. Note to self: double the quantity of Chili Glaze; it makes a tasty topping for the coconut rice side dish. Accompany with fresh tropical fruit and a bowl of steaming Coconut Rice for a dinner that will win you rave reviews from family and friends. 1. Rinse the chicken pieces, pat dry and place in a large non-metallic bowl or large ziploc bag. 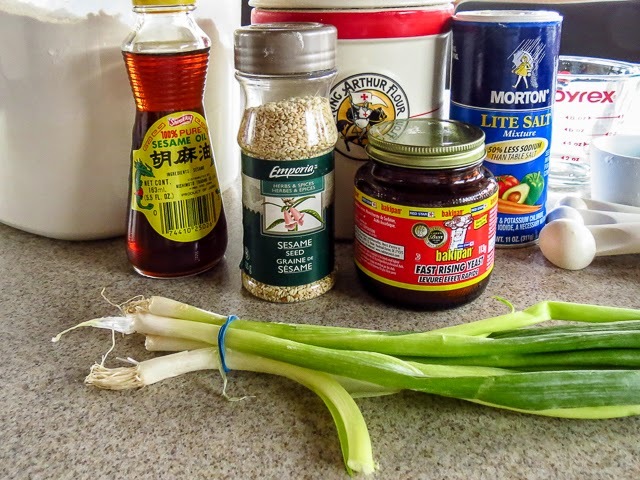 Mix together the coconut milk, ginger, lemon grass, lime zest and juice, pepper and hot sauce or chili flakes. Pour the coconut milk blend over the chicken parts and turn to coat all surfaces. Cover or seal airtight and refrigerate for at least 1 hour, preferably overnight. 2. 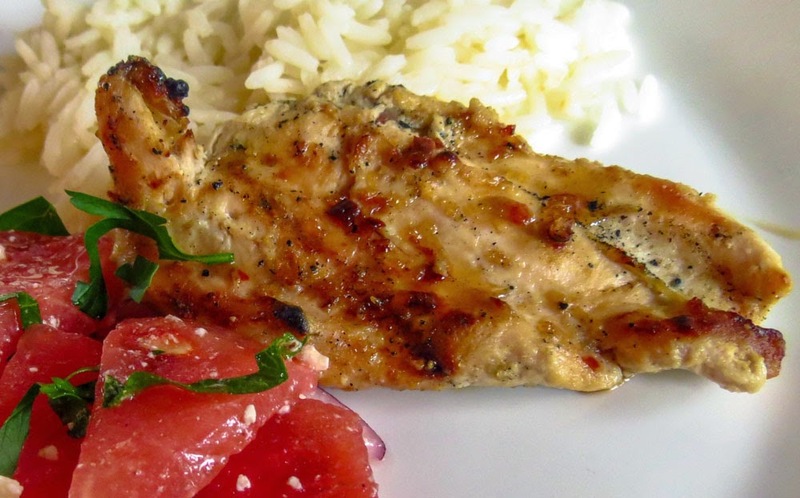 Remove the chicken from its container, reserving marinade to use while grilling. (Nuke the reserved marinade in the microwave or bring it to a boil on the stovetop if you worry about contamination from raw poultry.) Spread the chicken pieces flat and lay on a preheated, lightly oiled grill pan over medium-high heat or on an oiled barbecue grill. Cook, turning often, until the meat is no longer pink in the center (about 10-12 minutes), basting often with the reserved marinade to keep moist. Go ahead, use it all. 3. 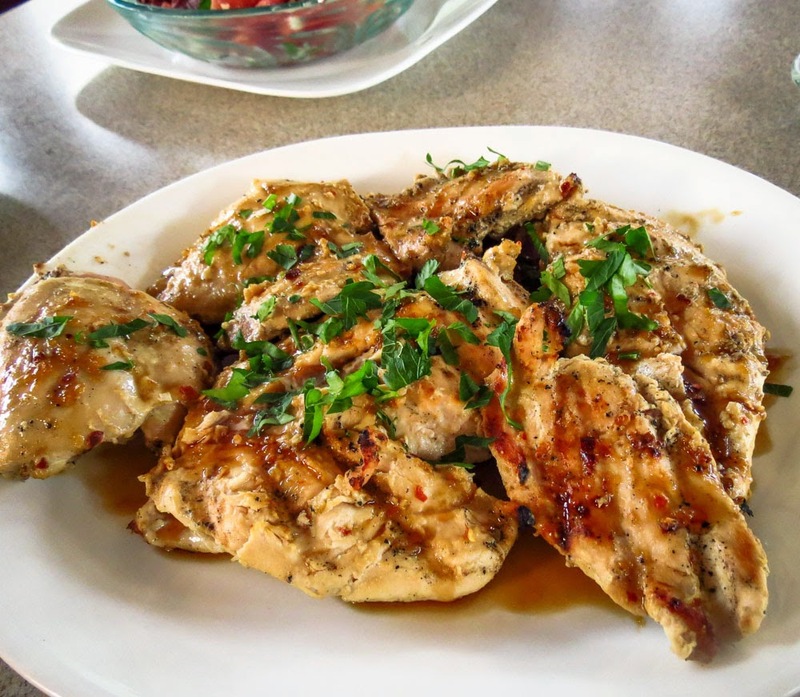 Remove the cooked chicken pieces to a warm serving platter and pour the warm chili glaze over each piece. 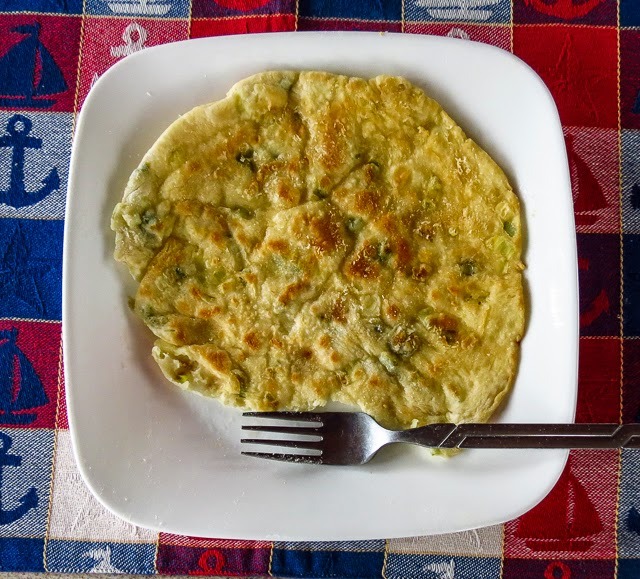 Garnish with green onions and serve with lime wedges. Use the glaze while it’s warm. If preparing ahead of time, reheat before using.